Schaeffler offers spherical roller bearings, which are suitable for harsh operating environments. Ideal for heavy duty industrial applications, particularly where very high load carrying capacities and reliability are key design criteria, or where there is a need to compensate for shaft misalignment, Schaeffler’s range of X-life spherical roller bearings offer longer operating life, improved machine performance and higher reliability. The X-life range, which includes eight bearing series with bore diameters from 20mm up to 1,030mm, is suitable for various applications, including continuous casting machines used in steel processing, paper mills, vibrating screens and wind turbine rotor shafts. Spherical roller bearings are double-row, self-contained units that comprise solid outer rings with a spherical raceway, solid inner rings and barrel rollers with cages. The inner rings have cylindrical or tapered bores. Many bearing sizes within the spherical roller bearing range are available in X-life quality. 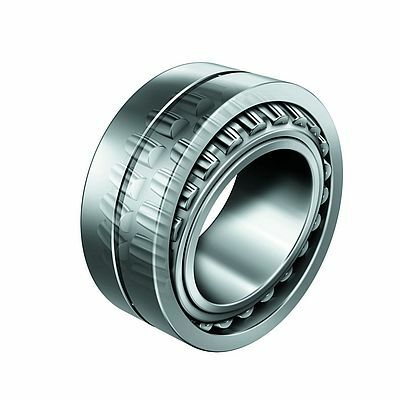 As standard, these bearings have no central rib on the inner ring and are therefore able to use longer barrel rollers. Furthermore, the bearings benefit from improved kinematics and optimised surfaces. As a result, the basic dynamic load rating and basic rating life (under similar operating conditions) are improved significantly. X-life spherical roller bearings are used as locating and non-locating bearings on continuous casting machines used in steel processing. The compact design of the bearing, combined with improved basic load ratings and friction-optimised kinematics, provide improved performance and longer operating life in tough, aggressive operating environments such as steel processing. The sheet steel cages provide excellent resistance to wear and contamination. Schaeffler also provides sealed spherical roller bearings in X-life quality for many continuous caster sizes. The standard dimensions enable easy mounting and replacement of existing bearings.